In a world of “Soft Kitty”, “Hello, Kitty”, and endless cute kitty videos, an ancient era which revered, feared and exalted cats is pretty hard to imagine. 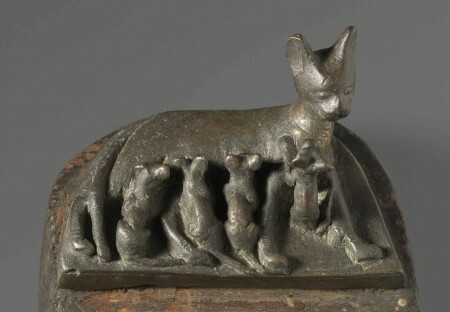 Yet, these quite ordinary, household pets are historically elevated at the Cincinnati Art Museum to “Divine Felines”. Loaned from the Brooklyn Museum’s vast collection, it reveals a dignified history of cats as gods in the time of Egypt’s pharaohs. Most feline deities were assumed to be feminine and goddesses of the sun. In the forms seen in this exhibit, they appear decorated with symbols of Ra, the sun. Jewels crown their heads, fill their eyes, or are attached as delicate earrings. The cat, itself, often becomes an amulet or a bead of jewelry, such as a gold bead in the form of a lion (closely related) measuring less than half an inch in height and length. Note the dates on these cat figures and drawings. Cats began to be domesticated in 4400 B.C.E. Originally appreciated for their fierce hunting skills, ridding homes and grain storages of rodents and snakes, and endowed with protective powers over domestic matters. These double attributes echoed the sun, seen as both beneficial and destructive; creatures with omniscient attributes. 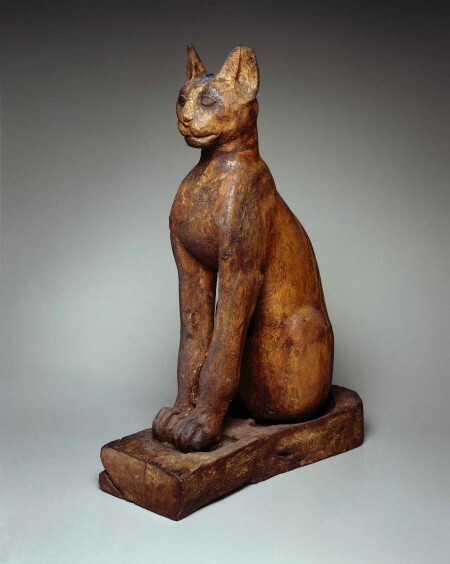 The carved wooden cats were usually sarcophagi for mummified cats, their excellent condition due to the dry desert air which preserved so much from the early Egyptian civilizations. A charming cat coffin is shown illustrated with references to the deceased’s inevitable rewards in afterlife. 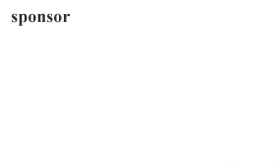 And saving a cat’s life ranked above preserving home and family. Egypt faced many of the same problems that dominate our contemporary concerns. The climate changed drastically. Higher temperatures and dryer land prompted lions to move south, deeper into Africa, relocating along a border area between Egypt and Africa. Once lions were no longer a danger, they moved into the realm of exotica, collectors’ items to be kept by royalty in zoo-like enclosures, and hunted for pleasure. The god- forms became more indicative of power , especially those portrayed calmly surveying their surroundings, emanating the confidence that lions, (and kings) can relax anywhere without fear. Lions and lions‘ paws were also decorative items introduced to furniture in royal venues. Cats were not so much worshiped as venerated, carefully, lest the more violent of them, such as Sakhmet, become wildly upset with humans and completely destroy heaven. The god, Bes, was charged with aiding transitions such as birth and death, while the goddess, Bastet, was a protector of the home, mothers, and children. Many of the smallest items sport a ring or hook to allow them to be worn around the neck for protection as amulets. Part II, “Modern Cat” continues on the balcony looking down on the main entrance of the museum, announced by a charming Joan Miro color lithograph, “The Little Cat”, facing the doorway onto the two arm-like wall spaces there. This space outside the door is often overlooked, seemingly separated from the temporary gallery, but it often adds a post script to exhibits that surprises and delights. On this occasion, colorful expressions of cats as we see them in our lives today are the perfect embellishment. “The Modern Cat” captures actions, emotions, naps in the sun, and the innate complacency of the cats in our own homes. Expressing perfect terror Jose Galicia captures “Frightened Cat” in just a few black and white strokes. Nearby, “Summer..Cat on a Balustrade”, Theophile Alexander Steinlen, with equal elan, lazily spreads a well- satisfied feline in the summer sun to doze. You can almost hear her purr. 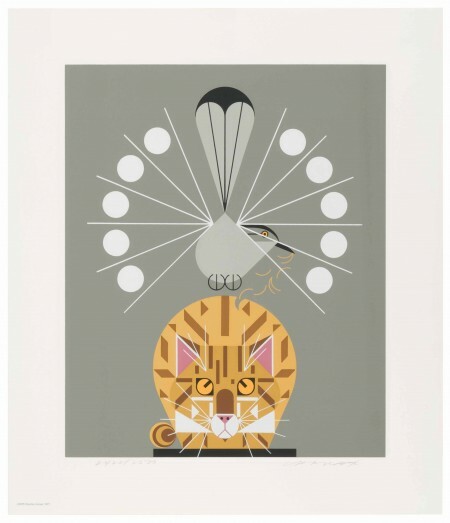 “Playful Cat” a color woodcut with hand coloring shows perhaps the happiest of cat pursuits, inspired by a shadow, a breeze, or a ray of sunshine, or just a passing need to stretch. A splotch of fun takes place for little or no reason. 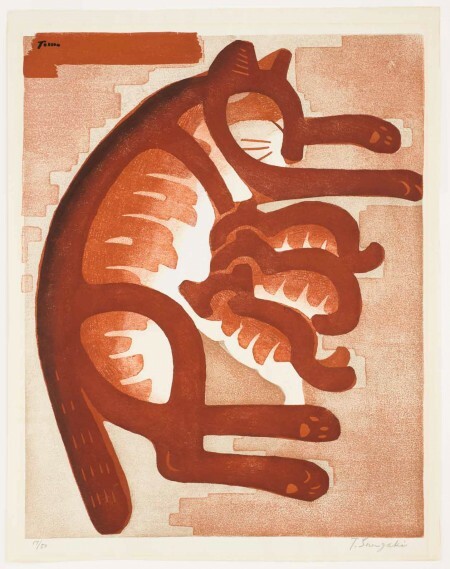 Japanese printmakers have the perfect grasp of cat-life. Their insouciant poses, impossible positions achieved with maximum grace, make them perfect models for art. Tomoo Inagaki shows several extraordinary stop action moments, but none so perfectly cut in wood as “Quarrel of Cats”. A cat fight is frightening to behold. The anger and speed of each strike, to say nothing of the howls, make it more than a sight. It’s an experience, one which is enacted here as if moving and sounding on the wall. I’m a cat person, while I know many are not. I’m also a great admirer of intelligence in all living creatures. So here’s a Google fact which perpetuates my admiration. One of the most remarkable facts so obvious in “Divine Felines” is the lack of evolution in cats. Other species have changed in 3,000 years, but from these images we can see that cats are just as they’ve always been, and probably will always be.